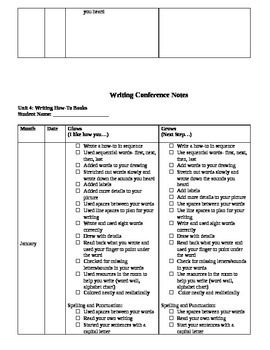 I created this writing conference notes form to make conferring much easier for me in my classroom. 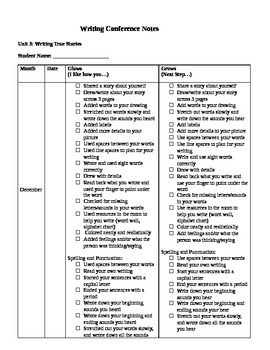 You simply print out a page for each student and keep it in your conferring binder. 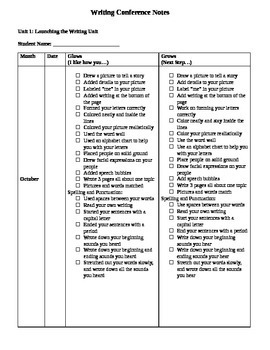 When you meet with a student you check off one glow (what he/she did well) and one grow (what he/she needs to work on). You should have about 4 checked off under each column every month. This is based on the older Teacher's College Writing Curriculum, but I believe it is universal for all kindergarten classrooms... just simply change the unit names. 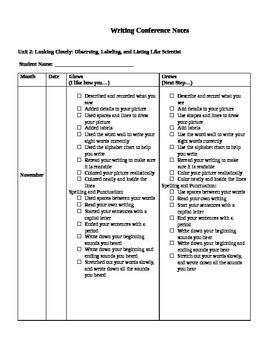 It has all the reading behaviors and comprehension strategies to look for in kindergarten with each unit. Easiest way to do conferring... Enjoy!